You don’t have to hit the Highlands for great backpacking routes. 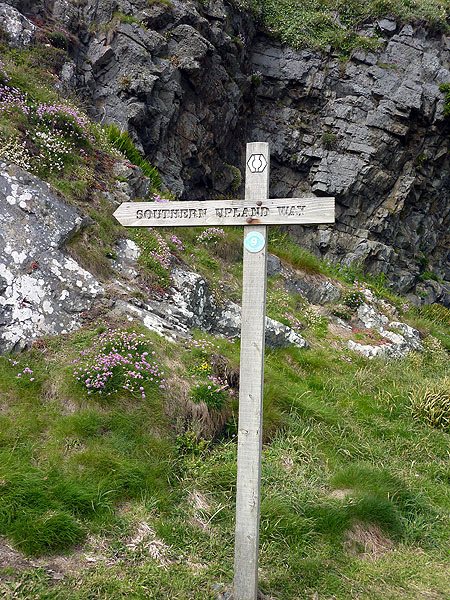 Scotland’s own coast-to-coast trail, the Southern Upland Way, is ideal for a mixed camping-and-bothying trip that crosses wild country with long stages between towns, and even roads. 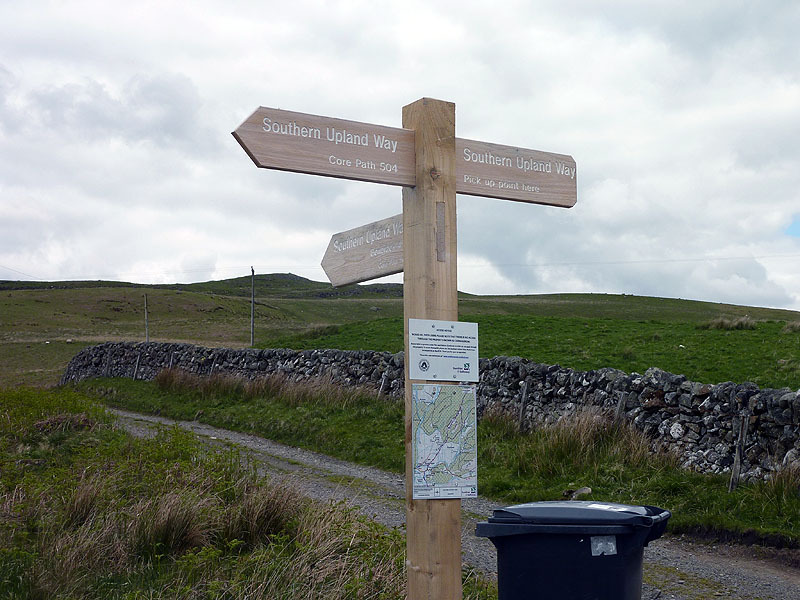 Keen to maintain an regular summer Scottish ‘fix’ after reaching Cape Wrath in 2014, I decided that the Southern Upland Way was an obvious next step. It’s remarkable how little-known this part of the country is, unconsidered as people speed north to the great cities of the central belt and beyond. Indeed, as I discovered, it’s actually more difficult to get to the Way’s start point of Portpatrick than any of the stepping-off points I’d used on my way to the far north. But it’s undoubtedly worth the effort. In 2015 I reached just over half-way in eight days, and recently I completed the remainder in seven. As a measure of how little populated this region is, the first 120 miles took me across only a single parliamentary constituency – as it happens, the only Tory constituency in Scotland. In that first year, after the short coastal start, I saw only a dog walker near Stranraer until I caught up three others on day five; there were several other ‘unaccompanied’ days on the second half too. 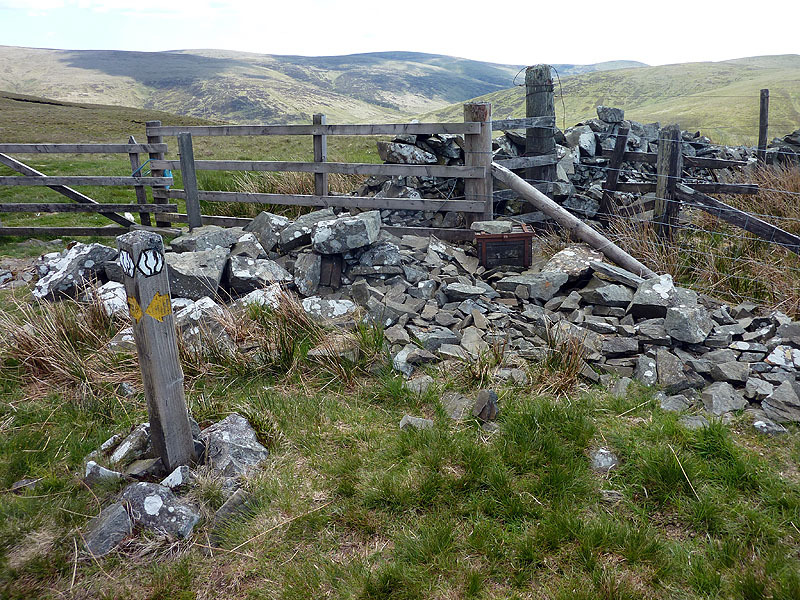 So the Southern Upland Way is, unquestionably, a great place to get away from it all. The town closest to the start point of Portpatrick is Stranraer, which until 2014 was the base for ferries to Northern Ireland, though these have since decamped a few miles north. The town retains a rail link, six times a day to Glasgow, and a reasonable bus service links it to Portpatrick. However for anyone coming from the south, the train is a very circuitous and slow route. There are two road alternatives: a daily coach from London, which arrives in the small hours of the morning; and a long bus ride from Carlisle and Dumfries, both of which have train stations. I did however choose to travel via Glasgow, taking the sleeper train there and the morning train back out – alas, this unconventional route let me down, as cows on the line meant we had to be ferried by taxi for the last two stops! If the walk is being done in two halves, then the obvious break point is Beattock, which has a good bus service to Lockerbie for trains south (and Scots can take the bus all the way to Glasgow). 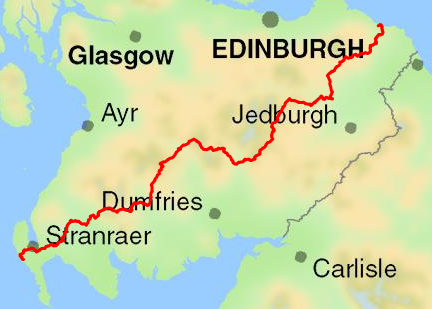 The ‘three thirds’ option uses break points at the towns of Sanquhar (rail and bus both north and south) and Galashiels (bus north and south, plus from autumn 2015 a re-opened rail line to Edinburgh). 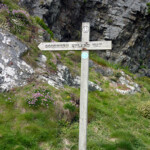 For all walkers, the end point at Cockburnspath has a reasonable bus service to Dunbar (for trains north) and Berwick (for trains south). In the western half especially, there are inordinately long stages between settlements of up to 27 miles (43km) – few walkers, myself included, would choose to undertake these day after day (and inexperienced walkers should on no account even try). There are two alternatives. The purer is to carry food, tent and sleeping bag, for a mixture of wild camping and bothying – there are several good bothies on or near the route, helpfully pretty much at the places they are most needed; and this being Scotland, wild camping is legal almost everywhere. For the 51-mile, nominally two-day Bargrennan to Sanquhar section in particular, use the service provided by Southern Upland Way Holidays. 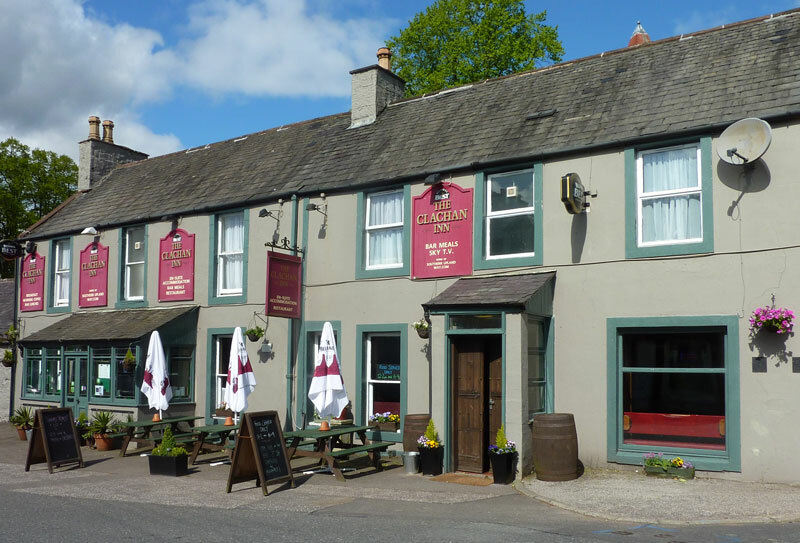 This splits the mileage into three, by using a couple of strategically placed pick-up points; you get picked up / dropped off by minibus, and taken to / from the excellent Clachan Inn at the pretty village of St John’s Town of Dalry. Plus point: staying at the pub. Minus points: you have to pay, and it’s cheating, just a bit. 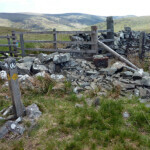 As well as the SUW Holidays site, there is an excellent section of the Rambling Man website devoted to the SUW – particularly useful was its hints and tips on the best spots for wild camping. I have to say I didn’t find the official site a patch on either of these; its accommodation finder is out of date, there’s not a mention of the Galashiels rail line one year on, and the maps are crude. Probably the worst national trail site that I’ve seen, as of 2016. How far is it, and how long does it take? See my table of distances and times, though be warned – on the latter half especially, I was very lucky with the weather, hardly needing to worry about boggy bits (and not at all about rain). On the western section, apart from the places mentioned above, the tiny settlement of Bargrennan and the former mining village of Wanlockhead both have good pubs, and the latter has a mining museum too (which alas I didn’t have time to sample, other than the tea room). Neither though has a shop. Castle Kennedy, near Stranraer, does, but no pub; there is a tea room in the famous Castle Kennedy Gardens, worth a visit even for a gardenphobic like me. The western half is full of metropolises compared to the west, though that’s purely relative. 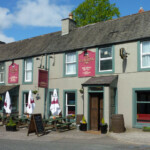 From Beattock – shop and pub just off route – some walkers divert to the town of Moffat just to the north. The famous Tibbie Shiels Inn at St Mary’s Loch closed in 2015, though there is a cafe nearby on the main road. The town of Innerleithen is not far from Traquair, and as well as Galashiels, Melrose and Lauder are on the route, all with good services. After Lauder, there are only two villages, Longformacus and Abbey St Bathans, neither with a shop, but the first does have accommodation (which I used on my cross-Scotland walk). I used Alan Castle’s Cicerone guidebook. 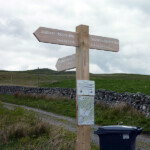 There have been some route changes since it was revised in 2013, so always be alert to waymarks. There is another, published by Birlinn in 2005, by Roger Smith. Both come with sectional maps but you will need your own to give a wider perspective. I found OS Landranger (rather than Pathfinder) to be sufficient and rather than take many rather bulky folded maps, printed off single sheets from my mapping software. 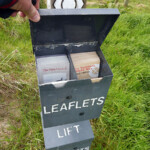 This route urgently needs Harvey Maps to provide a sectional map, as they do for so many other trails! Finally, for the collector in you, there are two sets of materials to be collected along the way. 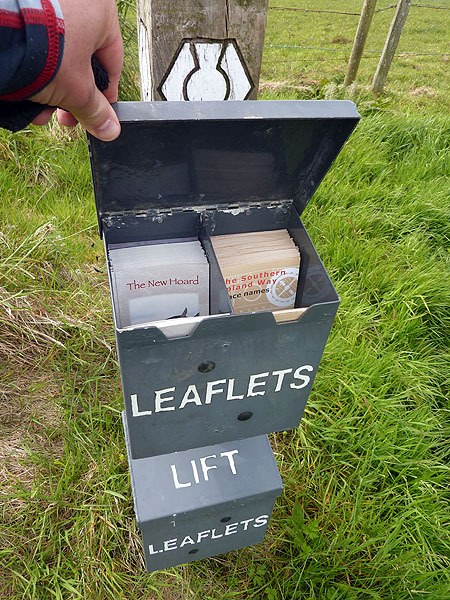 Leaflets giving information about features such as wild life and place names are placed in well-marked leaflet boxes; and a set of specially-minted coins, the ‘New Hoard’, are found a few paces from the trail near waymarks signed ‘Ultreia’ – finding the waymarks is one thing, the boxes are by no means always obvious.